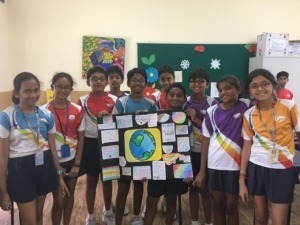 We are delighted to share a blog written by Nandini Hans, a student at Global Indian International School, East Coast Campus who is part of a team delivering a Global Goals project for the 2018-19 Global Goals Competition. An excellent opportunity to be a part of this noble programme. In this fast paced world, where people live a hectic life and are always on the run, humans are moving away from a kind world. The appreciation of small things around us value a lot. Kindness is a virtue which can be imbibed in children at a young age. Today it is very difficult to find a nation with golden hearts. In such type of society it is very essential for us to create Golden Hearts with golden feelings. Being kind makes you feel good about yourself and improves your outlook on life. At GIIS East Coast we are taking small steps towards spreading the message of kindness through various activities conducted. The challenge is to spread the message of kindness to a bigger audience outside the school. Will work out a plan with the team members. Future plans are to take Kindness beyond the school boundaries to the society.